Kit got herself a Cuttlebug in the end, and has been keeping busy making lots of lovely things. Random winner of some blog candy for taking part if Minx ………. please email me your address, and there will be something popped in the post for you. I apologise for not being around much, blame the credit crunch, it’s so busy at the day job, and then any spare time is taken up with Toddles & Binks when I get home, that there is very little time for crafting. I have lots of lovely T&B stamps to play with, an no time!!! Just as a quick catch up on, what is essentially quite a boring life at the moment ….. Guy took me to see the lovely Jon at the Maidstone Comedy Club last week – had a fabulicious time .. he was brilliant, funny and gorgeous as ever. It was my birthday yesterday, and I was completely spoilt by friends at work with loads of flowers, card, sweeties, chocolates and a beautiful velvet purse from my friend Karen. A Janome Mini Sewing machines from Guy, booze from oldest son, copics from Lydia and also the inlaws, a lovely jacket from my mum with socks and thornton choccies too ———– very, very spoilt am I! Apparently, another pressie on the way from Guy, but he won’t tell me what it is my two current guess are a light tent for photography or Adobe Photoshop for my laptop, as our current version doesn’t support Vista. I did think MM Slice, but I haven’t told him I want one …. but, I did mention it on the blog a while ago………. so suprise for me too soon. Trying to organise for Xmas, and not doing too well on that front. Right, that’s enough waffle……….off to sew stuff. EDITED: Ohh, I am planning to sell my Cricut and the cartridges I have ………. I need the space on my desk (and the cupboard)………….so check back later this weekend, and I will list it on a For Sale page on here. Ideally, as I don’t have a box for it, it would be somebody that could pick it up from me. I’ll be including the George Cartridge and spare cutting mats with it – but I will be happy probably to sell the other cartridges separately, and would be happy to post those at cost for somebody. this is a spare piece of the Roses in Winter paper I had left over, which is matted on dark purple. Made a 6×6 card, and then cut off a couple of inches from the front righthand side, ticket punched the cornners, and mounted the piece to the front of the card. 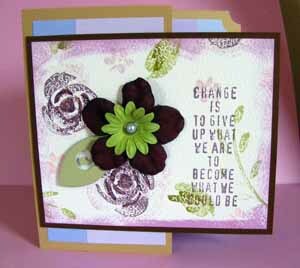 The quotation is from my new Tim Holtz set I got yesterday. It doesn’t show up in the photo very well, but I added Diamond Stickles to to the two stamped flowers, then added a dark purple silk flower, with a Prima Crasy Daisy in the centre of it, secured with a Papermania brad and a single leaf from the Walk in the Garden Cricut Cartridge I had haning around on my desk. phew, managed to get my entry done last night. This week’s was a to do a large monogram of your name. 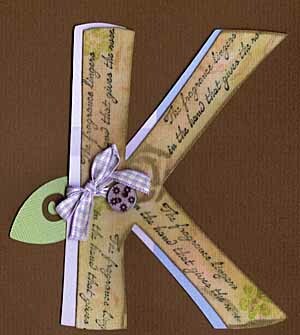 Obviously then, mine was a “K”. I did wonder what I’d use it for then it occured that as it’s Karen’s birthday tomorrow, I will add it to her flowers (I used the same stamps as for her card). Check out the challenge over at their Cyberblog (there a link in my side bar), as there’s blog candy up for grabs, and you’ve still got a few hours to get it done. My Cousin had a baby boy at the end of last week, so this is off to NY. Like buses, my cards usually come along in 2’s or 3’s, as I tend to use the stuff that’s hanging around in the vicinity of my craft desk. So if it looks a little similar to the last one, that’s because I used the same kind of card blank and the darling Sweetwater stars pattern paper. Other supplies: Cricuit was George & All Mixed Up Cartridges; Stampendous “Hello Baby Set” for main image, inside the card and the envie; COPIC Markers; Palette Noir Ink. 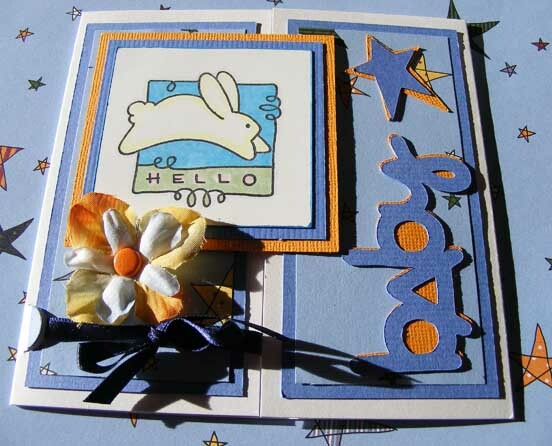 Also orange Bazzill and blue Scrapbook Sally cardstock, ribbon, silk flowers and orange brad. 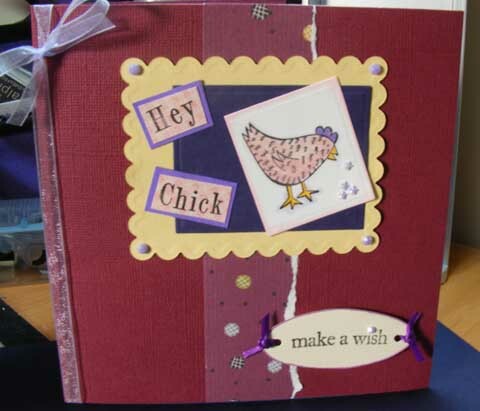 this week’s challenge was to create something for a female – perfecto – it’s Paula’s birthday on Saturday, so I used my new Chicken stamp. OMG, I had such trouble with the MM magnetic stamps I’ve lost the handle that came with them, and had to use a magnetic block – know I remember why they’ve pretty much never been used. I have to say that they are just the perfect size, obviously I just need to persevere with them though. Quite a plain card, and I’m not sure if there’s something missing. Possibly I should have matted the pattern paper down the middle. I saw one of them there MM ribbon tag attachment tools – sorry, I know that’s a really bad description – I think I might want one. Rather than rely on that dodgy description, I’ll try to find a demo clip of it. Chiaro Flo Clear Embossing Powder – SG-me! 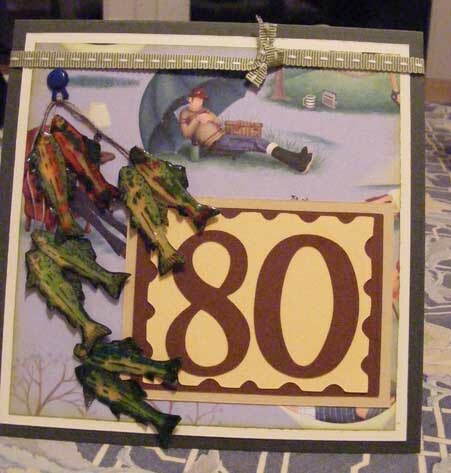 Used the Base Camp cartridge to cut the 80 and the postal stamp rectange and shadow background. Stamped out the fish, roughly coloured in with COPICs, covered with Versamark and then several layers of Chiaro Flo (I know that it’s our own product, but it really is the most amazingly clear EP!). Well, well, well …………. Peep Show won best Situation Comedy at the BAFTA’s last night, it was worth sitting through the whole thing just to see that. Such a shame the lovely David Mitchell didn’t win best Comedy Actor (he was robbed). I’m not a fan of Gavin & Stacy and don’t see the appeal of the fat chap, James somethingorother, who did win. To celebrate I ordered the Series 1 of Peep Show for Rob (ohhh, I admit it me too) – who is now a massive convert to the series and a huge fan of the wonderful creation of Mark Corrigan. Ohhhh, I likey the new WordPress add an image changes, much better. Just a really quick card from last night, I thought I’d break myself in gently. Ages and ages ago I bought an Anna Griffin box set from Creat & Craft TV (and as with a lot of stuff never used it). I found it again last night as I was going through the stuff to be put back into the new kitchen, and right on the top of the box was this loevely pattern paper. 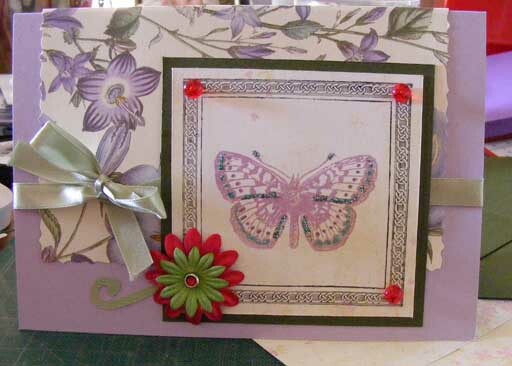 Card blank, pattern paper and ribbon and butterfly and frame stamp from the AG box, with the addition of Prima Daisy Crazy “Jasime”, PM red jewel brad, a portion of a Cricut swirl, Sakura pens, green Stickles and Rudolph’s Nose Zoomz.